The Maryland Transport Authority has reported that 19,000 users requested to close their E-ZPass accounts last month as the new $1.50/month fee went into effect on July 1. The MTA has had over 40,000 requests since January, when the fee was announced. Officials at MTA insist the dropped accounts are a small fraction of the nearly 560,000 passes still out there, responding to the Examiner by saying the canceled accounts were from infrequent users. They claim the losses are somewhat offset by new accounts, but declined to say how many new ones they’ve received. They were quick to point out, however, that there are still over 70,000 accounts that haven’t been used in over a year. Those inactive accounts cost the state $2.25 each to maintain. No word on how many of the drivers who canceled went over to states that don’t charge a fee. How the hell does it cost $2.25 to maintain an account that is not being used?? What kind of ridiculous infrastructure to they have in place over there? Is that cost a month or a year? That $2.25 number fails the sniff test on a multitude of levels. The biggest one is this: at $2.25 per month that would total up to $27 per year. Round the subscriber base to 500,000 and you have a total cost of $13,500,000. There’s simply no way it takes shy of 14 million bucks to administer those accounts. The MTA’s total of ALL their operating salaries are listed at 28.6M in their 2008 annual report and their total engineering expenses were 10M. So clearly that number is not representative of all accounts. Which is problematic, because if it was then at least you could assume that it was simply rolling up the cost of all the hardware into them as a way of computing total costs. It would be dumb, but might make some sense. It seems far more likely that the Examiner has goofed this up and confused an annual cost with a monthly one. You can look at the MTA supplemental report for 2008 here and it shows an E-Z Pass total FEE revenue of $8M, which includes the $21 transponder fees collected for new signups and other penalty fees. E-Z Pass toll revenues were 20% greater than cash revenues, which is very interesting. 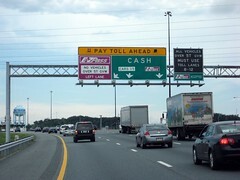 By any measurement it’s cheaper to collect tolls that way than pay labor costs. If this $1.50 fee reduces usage it won’t take much to negatively impact the bottom line.